African Union Extraordinary Summit on #AUReforms begins with the aim “To make Africa stronger and give our people the future they deserve"
Addis Ababa, Ethiopia, 17 November 2018- The supreme organ of the African Union, the Assembly, which comprises Heads of State and Government of all the 55 African countries, began its 11th Extraordinary Session today with a call to advance the institutional reform of the Union, as events on the continent, and across the world, continue to confirm the urgency and necessity of this project. The Assembly meeting is the culmination of the AU’s statutory meetings, and was preceded by the meetings of the Executive Council and the Permanent Representatives Committee. •	Division of labour between the African Union, RECs and regional Mechanisms, Member States and continental organisations. The Assembly will also consider the Report of the Chairperson of the Executive Council on the Outcome of the 19th Extraordinary Session of the Executive Council, enlarged to the Ministers in charge of African, Caribbean, and Pacific Group of States (ACP) and European Union (EU) Matters. Reports on the Pan-African Parliament and Judicial Organs, the AU Peace Fund and proposals on the New AU Scale of Assessment will also be presented. While speaking during the opening session, the AU Commission Chairperson Mr. Moussa Faki Mahamat noted the need for the AU Commission to have a greater degree of flexibility in administrative management, so as to enable it to respond more quickly and effectively to the situations. The AUC Chairperson underlined the importance of enhanced accountability to the Member States and absolute transparency in the conduct of the affairs of the African Union. Mr. Moussa Faki Mahamat concluded by emphasizing that it is equally important that the Summit consolidates the progress made on the financial front. President Paul Kagame of Rwanda, who is the Chairperson of the Union for 2018, summarized the purpose of the summit as “to advance the institutional reform of our Union. Events on our continent and across the world continue to confirm the urgency and necessity of this project. The goal is simple: To make Africa stronger and give our people the future they deserve”. 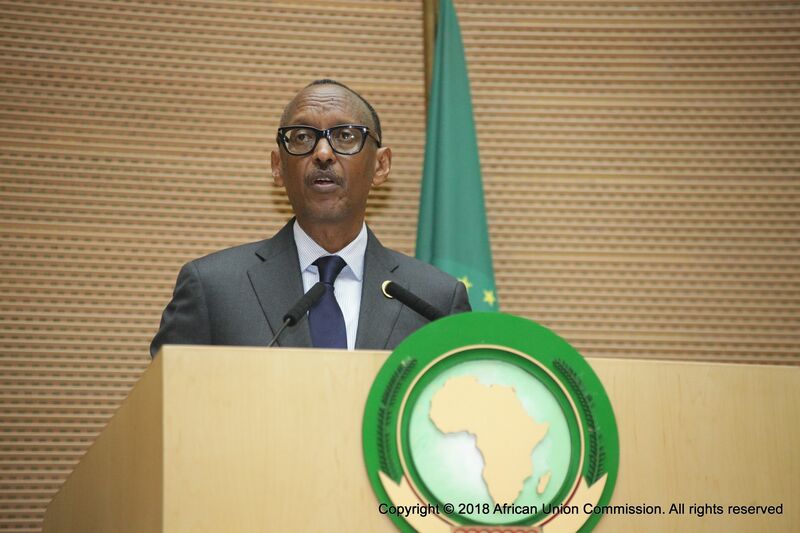 Addressing the reform of the African Union Commission, which is the secretariat of the AU, President Kagame noted that the reforms would make the Commission more effective and performance-based, now and in the future. President Kagame welcomed the lifting of sanctions against Eritrea by the UN Security Council noting that “This action will contribute to the ongoing process of normalization in the Horn of Africa”. He thanked Prime Minister Dr Abiy Ahmed of Ethiopia and President Isaias Afeworki of Eritrea and the other leaders who worked with them, for their courageous actions. He also sent his condolences to the governments and the people of Malawi and Tanzania on the tragic loss of their valiant soldiers involved in the peace keeping efforts in Africa. Ethiopia’s Prime Minister, Dr. Abiy Ahmed also addressed the Assembly’s opening session. He highlighted that Union wide reforms were necessary, not just for the sake of initiating reforms, but because it is a must. Prime Minister Ahmed also emphasized that one of the reform initiatives that is of paramount importance is equal representation of women in key decision-making and leadership positions, which has been one of the key pillars of his reforms in Ethiopia. A summary of the summit’s key decisions will be presented at the final press conference to be held at the end of proceedings on 18th November. A summary of the key decisions of the Assembly will also be posted on www.au.int soon. Discours du président de la Commission de l’Union africaine á l’occasion de la session extraordinaire de la conférence des chefs d’État et de gouvernement de la communauté des États Sahelo-Saharien (CEN-SAD).